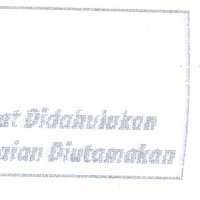 Traditionally, postmark on envelope was printed using block that sometimes smeared and rendering the stamp to be covered with black ink or the text cannot be read. 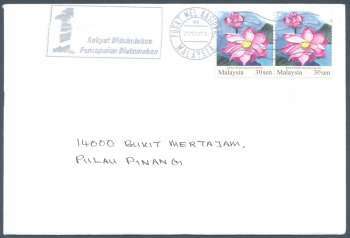 But this cover, its postmark has been PRINTED using printer which can be easily analyzed and proved. Using a printer, the post marking looks even better and clearer without dirtiness. Two stamps were attached on top-right, valued 30 sen (RM0.30) each as standard Pos Malaysia postage rate in 2013 is 60 sen (RM0.60) for 20 gram or less. 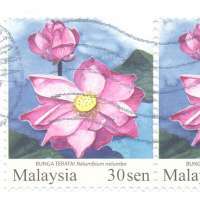 The stamps were in the theme of Flora (General Flowers) depicting Garden Flower - Nelumbium nelumbo (English: Lotus flower, Malay: Bunga teratai). It was made available for the public on 1 July 2010.
and five wavy lines with 39 mm in length. O - So far is unknown machine type. Posted from unknown town in Malaysia to an address in Penang. Received on 29 January 2013.